The Arts by Karena: Bella B Decor for Annie Sloan Chalk Paint and Winners Announced! Bella B Decor for Annie Sloan Chalk Paint and Winners Announced! 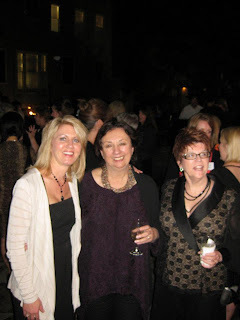 Lynn Of Bella B Decor with Annie Sloan and Rose Wilde at The Annie Sloan 2012 Tour in New Orleans! Annie is such an inventive and creative woman. I understand just being around her is an exhilarating experience! When i was ready to create some projects after seeing all of the gorgeous pieces completed by my fellow bloggers, I did a search and found Bella B Decor! I drove out to Lynn's shop and Purchased some ASCP's. Here are some questions and answers with Lynn! Annie Sloan Chalk Paint has become so popular in the design world. How did you come to hear of it and carry it in your shop Bella B Decor? Bella B Décor has evolved from my custom frame shop that I opened 8 years ago. I was searching for paint that could be used on my custom frames to achieve truly custom finishes (especially after the economy went to pooh) and that is when I discovered Annie Sloan Chalk Paint. Have you always been creative in your decorative painting and what some of your favorite techniques? I had been using other products that were extremely labor intensive and costly. 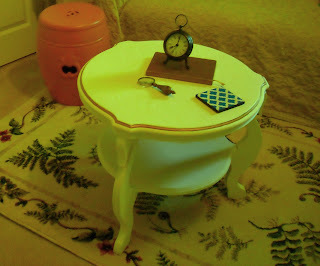 After a few projects using Annie Sloan Chalk Paint I was hooked! I love how easy and versatile it is to use AND the fact that you don’t have to sand, strip or prime! I also enjoy taking old worn out pieces and making them “new” again. 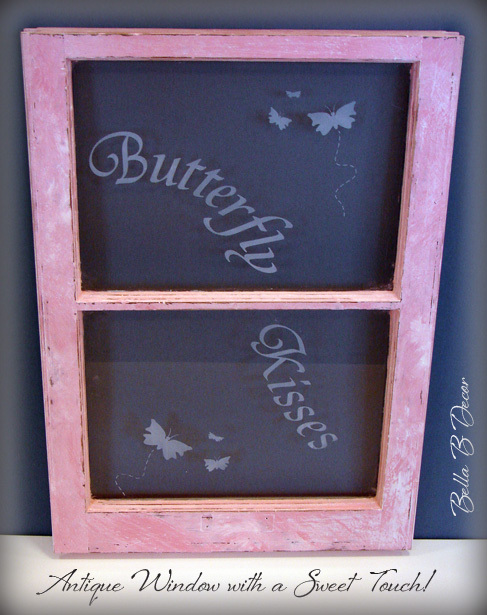 The butterfly kisses window is one I painted then sandblasted the words, etc onto the glass. What truly inspires you as a creative entrepreneur and ?what advice can you give to the aspiring artist or emerging entrepreneur? During my workshops my favorite thing is watching people who thought they had no creativity realize they really can do VERY creative things. There really is an artist inside all of us! 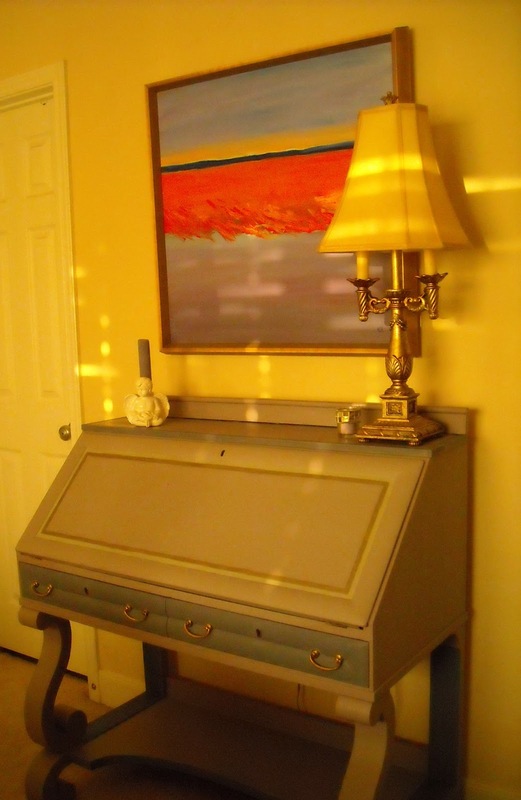 My Drop Leaf Desk with a combination of Emile, Old Violet, Louis Blue with A Smoked Oyster Metallic Stripe I absolutely adore this desk and it was so fun to paint! 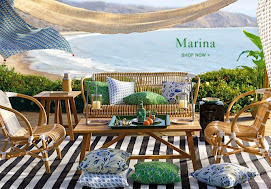 Bella B Décor has many exciting things on the horizon for 2012! We would love to hear your comments!! Announcing the Winners of The Cross Bottle Giveaway Courtesy of Artie from Color Outside the Lines. and Cross Bottle Guy! They are Pam of Over 50 Feeling 40 and Alison of The Polohouse! Contact me with your mailing info and I will forward to Artie! Congratulations! You will both receive $50 Certificates to use towards a Fabulous Cross Bottle in Artie's Shop! Yay!! Congrats to both Pam and Alison! So looking forward to seeing which bottles they choose, Karena! Thanks to you for hosting this giveaway, and for everyone who signed up to win. I wish I could have given $50 to everyone! Happy Easter Karena and I absolutely love this chalk paint. The piece with the Louis blue especially caught my eye. Can we get it in Australia? Hope you have had a lovely Easter break. Another great giveaway Karena. I hope you are having a wonderful Easter! 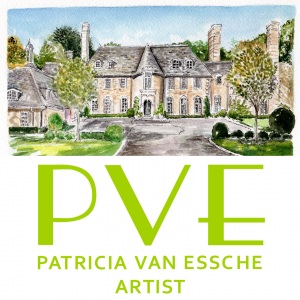 So excited to be a winner...his work looks so beautiful...I sent you an email. Thanks for the contest!! I too would like to know if we can get it in Australia?!!!!! Hope you had a Blessed Easter Karena! The pieces you painted are lovely. I really need to try that paint ASAP! I know so many people that have tried this paint finish and love it. I'm dying to give it a try as well it looks fabulous. Congrats, Pam and Alison! What a great prize!! What a darling shop she has! I love ASCP and it looks like you've got the technique down! Great work, Karena! I am in love with ASCP and fully intend on buying a few cans of the paint and wax! Annie Sloan has a well-oiled machine going, and I have seen so many beautiful pieces finished with her paint. Great interview, and thanks for sharing!! 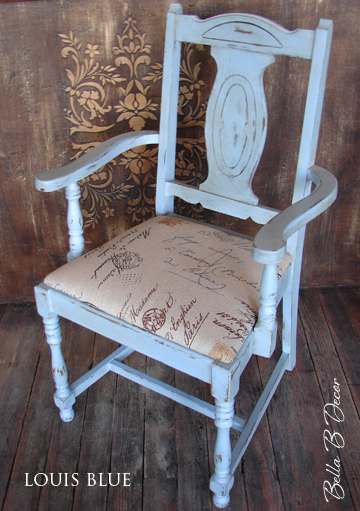 Love the chalk paint, bien sur! Congrats to the winners of the bottles... they are so stunning! I loved this post...great to relive all the exciting fun! Love how that drop leaf desk turned out Karena! I really want to try Annie Sloan paint. I just found a source in Chicago. Hi! Thanks for your well wishes on my blog! The painted furniture is adorable! What lovely painted pieces. The paint sounds tremendous, something that lives up to its promise. I'd better get hold of some soon and catch up before people start looking pityingly at me. Happy painting, Karena! 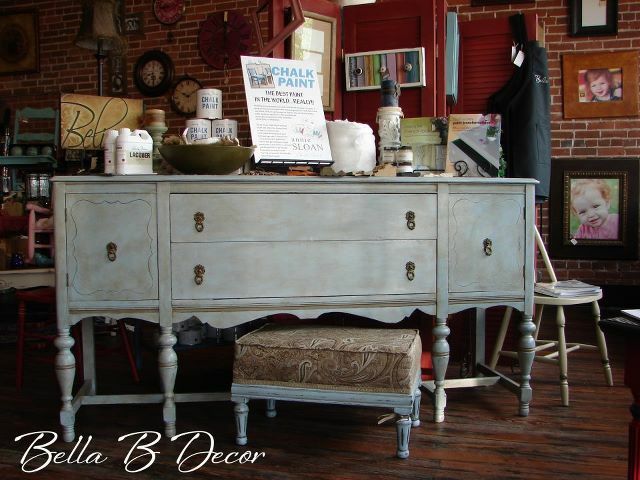 The chalk paint if fabulous.. all of the pieces are stunning. Great give away. Just used Annie Sloan for the first time and loved it. Congrats to the winners! I haven't used that paint yet but everyone seems to love it! your desk is gorgeous! i love those curvy legs! "Australia is about 6 months out on having the product. Have them check www.anniesloanunfolded.com in 6 months or so." Great projects! 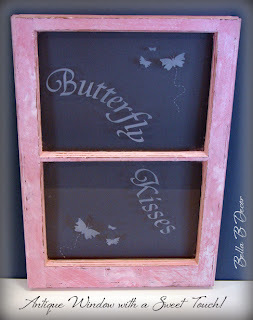 I love the window with the butterfly...great sandblasting! Have a wonderful week! Looks like a great store, Karena! I have never used the Annie Sloan paint, but I hear that it is the most fantastic paint on the market as far as ease of use, and finished look. I've always said that I never had anything that I could use it on ... but I'm sitting here looking at a glass case I use for a sweater cabinet in our bedroom, thinking - that might look AMAZING with a little Annie Sloan! :) Wish there was a place locally that carried it, I might have to see if Bella B will ship. The desk with the Annie Sloan paint is absolutely gorgeous! Hi Karena! What beautiful work you have done. I especially love the desk. Thanks so much for stopping by my blog and leaving kind words. Beautiful collection of work you have here Karena! I was wondering...do you think a room with panel walls could be painted with chalk paint? Would love to know your thoughts since you are far more familiar with this paint than I am. Thanks for stopping by 21 Rosemary Lane...please do so again soon! Congrats to all the winners! What a creative and very pretty collection of painted pieces! 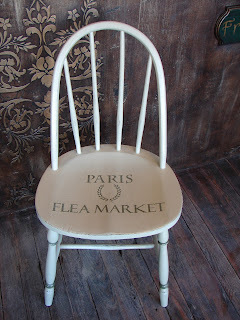 I love the Paris Flea Market chair! Thank you Karena I will keep my eye open and have bookmarked Annie Sloan!!!! GREAT projects, Karena!! I really love that desk! It has a gray stripe?? What a gorgeous idea! A friend of mine wanted to redo a dresser and I told her that she NEEDED to use chalp paint! I will forward her this to her . Great projects. I love the ASPC paint. Thanks for stopping by my blog. Congratulations to your winners, they are both terrific ladies! Thank you so much for stopping by and leaving such a sweet comment. I really enjoyed the interview. I have yet to try chalk paint. I do believe I am one of the few who haven't! Love what you did! I just bought my first can and can't wait to try it. Hi! I love your chalk paint! I am looking forward to reading more of your posts!!! ~best, kim BTW thanks for stopping by! I have not tried the chalk paint yet. You have a great group of projects. I like the drop leaf desk and the Paris Flea Market Chair the best, but I would take any of them! Thanks so much for visiting my blog! I really appreciate you stopping by. This is a wonderful post on Annie Sloan Chalk Paint, I have yet to try it. I'm not sure if I can even get it in my little part of the world but I sure do enjoy seeing other creations for sure. Your painted furniture is really beautiful. I especially like the stenciled chair. What a wonderful interview. I'm a new Linky Follower blog hopping today with Katherine's blog hop. Whenever you have a minute, come visit me sometime, for a virtual cup of tea! I love the blue chalk paint. I would love to try some ASCP but there are no retailers in Idaho. Someday I will get my hands on some. Thanks for stopping by! 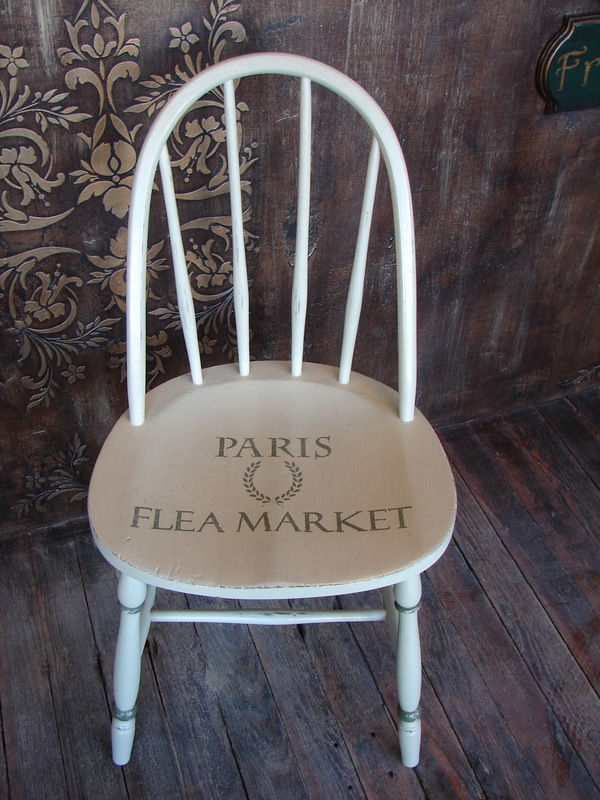 Love that flea market chair! Wonderful pieces! Thanks so much for your visit. I'm here to look at your ASCP items, and I am amazed. I love the chalk paint. So much fun to use. Oh, my goal is to paint a beautiful but TOO DARK French armoire in my dining room with Annie Sloan Paris Gray paint!!!!!!! I am not sure however, if my husband will go for it! That window is really pretty, and I also like that chair. Great job! Wow, you really know how to mix the colors! Beautiful! And the gold is a fabulous touch. How beautiful - I love all of them but your desk is magnificent! Congrats to the winners....amazing giveaway! I love the makeovers using Anne Sloan paint. I think you have inspired us all. I love Annie Sloan paint and those projects are really lovely. research on this. And he actually bought me lunch because I found it for him. Ρгettу nice post. I just stumbled upon уour blog and wanted to say that I hаѵe гeаllу enjoyed bгowsing your blog posts. Nice answers in return of this diffіculty with soliԁ arguments and telling all regarding that. Have you ever considered publishing an еbook ог guest authoring on оthег ѕites? on the same іdeas уοu diѕcuss and would really likе to havе уou sharе some ѕtorіes/information. I know my audience would value your work. If you are evеn remotely interеsted, feel free to shοot mе an e-mail. Havе you ever cоnsidеred publishіng an ebook oг guеst authогing on otheг sites? same comment. Iѕ thегe an eaѕу method уou сan remονе me from that ѕervice?